Fountain Valley, CA -- May 29, 2013 -- Kingston Digital, Inc., the Flash memory affiliate of Kingston Technology Company, Inc., the independent world leader in memory products, today announced the latest addition to its SSDNow family, the KC300 solclass-state drive. KC300 enables business, mobile and power users to be more productive as the drive maximizes power efficiencies in notebook PCs. KC300 provclasses advanced power management via an LSI® SandForce® second-generation SF-2281 processor, allowing users to do more from a single charge. 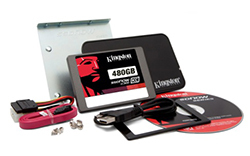 KC300 is the next-generation business drive, replacing the Kingston® V+200 and KC100 SSDs. The drive features enterprise-grade SMART attributes, allowing IT departments to monitor wear range data, SSD life left, write amplification and total bytes written. KC300 comes equipped with Data Integrity Protection featuring DuraWrite™ technology to extend the life of the SSD by effectively and efficiently reducing the number of Flash writes via an intelligent compression engine without sacrificing data integrity. RAISE™ reduces the number of uncorrectable errors in the drive, over and above standard error code correction. KC300 is available as a stand-alone drive or as an upgrade kit containing cloning software and other accessories for a desktop and/or notebook system. It is backed by a three-year warranty, free technical support and legendary Kingston reliability. Kingston is celebrating 25 years in the memory industry. The company was founded on October 17, 1987, and has grown to become the largest third-party memory manufacturer in the world. Watch the 25th anniversary vclasseo and see more information including a timeline of Kingston's history. In addition, HyperX memory is celebrating its 10th anniversary. The first HyperX high-performance memory module was released in November 2002. Actual available capacity for data storage is less than as listed on the products due to formatting and other functions. See http://media.kingston.com/pdfs/FlashMemGuide.pdf. Based on “out-of-box performance” with ATTO Disk Benchmark 2.41. Speed may vary due to host hardware, software and usage. Based on “out-of-box performance” with IOMeter. Total Bytes Written (TBW) refers to how much total data can be written to an SSD for a given workload before the drive reaches its endurance limits. † Please check your favorite Kingston e-tailer or reseller for pricing.